The usual rules of such questions apply; the answer is, of course, no. I’d better begin, by stating yet again that my beef is not against any particular church, or Christianity, or religion per se; this post drills a bit deeper into the information I’ve dug out since being asked to speak at a school debate on the motion “This house would abolish state-funded faith schools”. It is a common trope of the proponents of state-funded faith schools that they meet the needs and desires of faithful parents to provide a confessional education for their children, but not out of their own pockets, rather the state’s. In preparing for the debate at George Heriot’s School yesterday, I took a look at the Scottish Government’s own statistics on schools as at September 2016 [link, xls]. 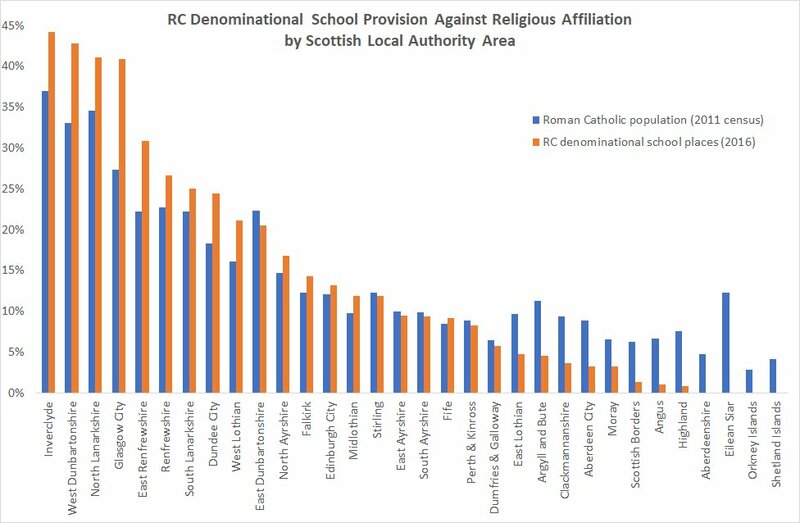 I’ve abstracted from that data the following data on the number of school places by denominational or non-denominational status for each local authority area in Scotland. I want to add a note of caution about religious affiliation as recorded by the census. Census returns are completed by the “head of the household” and are likely to attribute to children the religious beliefs of the parents, potentially over-representing religious belief across the whole population. This is why census data is popular with religious apologists, because it provides the highest numbers when compared with other surveys of religious belief when individuals are canvassed. There are a number of interesting observations that fall out from this analysis. The distribution and density of Roman Catholic denominational schools represents the historic settlement of Irish Catholics migrating to Scotland over the last couple of centuries. In fact, I count my ancestors in this number. Assuming that the proportion of denominational provision hasn’t really changed in those local authorities since Roman Catholic schools started to receive state funding 100 years ago, there appears to have been no attempt on the part of the Church nor the local education committees to ensure that denominational provision met local demographics. Again assuming that the proportion of denominational provision matched the proportion of the population of the same confession, it would seem clear that the number of confessing Roman Catholics has declined significantly in the last 100 years. If I can track down some historic census data, I’ll add that in. This results in over-provision of denominational places in the West of Scotland (with the exception of the expanding and affluent East Dunbartonshire) and an under-provision in many other parts of Scotland, particularly the north-east. There are no Roman Catholic denominational schools on any off-shore island in Scotland with the exception of the Isle of Bute, which lies just off Argyll in the Firth of Clyde and bumps into the mainland in a heavy swell. If the Roman Catholic church were genuine about providing choice to its congregants, would we not expect them to be seeking to establish new denominational schools, particularly in places like Aberdeen and the Isle of Barra? Why are the islands altogether not worthy of the same parental choice as the West of Scotland? Why are local education committees content to continue with significant over-provision of denominational schools in places such as Glasgow, West Dunbartonshire, East Renfrewshire and Inverclyde? Ultimately, many of the arguments that proponents make for the continuation of denominational or faith schools in receipt of state funding come down to retaining embedded privilege. A good school will be a good school without giving one religion priority. Surely good Catholic teachers will still be good Catholics – and good teachers – in non-denominational schools? And perhaps less time will be wasted, as it was with my own schooling, in telling children to make space on their chairs for their guardian angels. George Heriot’s School in Edinburgh have a school debating society which, from time to time, invites guest speakers to debate a motion. The Scottish Secular Society were asked to put up a speaker to propose the motion, “This house would abolish state-funded faith schools“, and I offered to act as proposer. The speaker for the opposition was Barbara Coupar, from the Scottish Catholic Education Service. The opposition to the motion was based on arguments of the democratic will of the people; parental choice; faith schools providing diversity; a fear of doctrinaire and monolithic secularism; the gifting to the state of the church’s school assets for the public good etc.. I met some wonderful, articulate, thoughtful and passionate young people who gave the speakers a testing examination before decisively supporting the proposition. To be honest, it was such fun having the conversation with tomorrow’s citizens that I wouldn’t have minded had the vote gone the other way; but I’m so glad it didn’t. The full text of my opening speech and closing remarks are set out below the fold. I’ve also included links to some source materials. In another post I’ll provide some more data on the scale of provision of denominational school places in Scotland. I’ve been having a wee ranty thing on Twitter about the SNP’s recently-published white paper on an independent Scotland. Peejay (@peejaydee70) has challenged me to explain my thinking a bit more, so Peejay, this post is for you. We are offered a binding referendum on the question of whether or not Scotland should be an independent country. That’s it. Everything else that really matters – what the constitutional and economic settlement might be, is unknown. Even when those matters are known, the people of Scotland will have no say in whether or not they are acceptable to them, or whether they can be satisfied that the settlement will result in a modern European nation in which everyone can flourish, both socially and economically. I am generally opposed to buying a pig in a poke, and by the time the cat’s let out of the bag, it will, of course, be too late; the deal will have been done. Failure to establish a secession process whereby any constitutional settlement has to be put to the people who must live under it is fundamentally flawed and shows contempt for the intelligence of the Scottish people. It is also perilous for our negotiators and the nation. If the referendum is in favour of independence, then our negotiations will be in the hands of politicians for whom independence at any price, rather than the best possible outcomes for the people of Scotland, will be the priority. We’re not going to have a strong and authoritative place at the negotiating table if those representing us look like drowning men who would settle for a box of matches rather than hold out for a lifeboat. Scotland’s negotiators will have more power if they can assure the other parties that any settlement must be acceptable to the people of Scotland in a final referendum. There are many examples of nations gaining their independence without settling such fundamental constitutional matters first, but what’s at stake is actually too important to leave until later. The SNP promise all sorts of things about our currency, borders, citizenship, trade freedom, membership of the EU (not automatic), structural debt and so on, none of which can be known until formal negotiations are concluded. That’s the time to put the formal question to the people, rather than promising everything without evidence and dressing up a party manifesto as the constitutional arrangements for a modern democracy. I am a proud Scot, but I will not be bought or sold by a parcel of rogues without knowing the price of my head. This impoverished vision is for a medieval society instead of a modern secular republic. The SNP have a long and unsavoury track record of sooking-up to priests, princes and popes which does nothing to challenge the unwarranted privilege of religion and kings in our society. The white paper demonstrates the failure even to conceive of a modern European democracy by promising to retain the Crown and the place of religion in Scottish society. Instead, we should expect a clear and bold vision of a new and different sort of Scotland, rather than fossilising these archaic and unequal privileges in any new settlement. Firstly, the politicians want to keep a monarchy in Scotland. Apart from the mediaeval anachronism that is having a magical parent to an infantilised population, I have no desire to be someone’s subject, least of all to woo-believing, tree-hugging foreign loon. As a humanist, I no more wish to bow my knee to a human demi-god than to the fantastic imaginings of an iron-age sheep-herding patriarch. Constitutionally, keeping the English crown poses serious issues – do the people have the power to rule themselves through their elected representatives in their own parliament, or do we cede powers to some manifestation of royal prerogative with secret and unaccountable privy councils making the decisions that affect our liberties? And how do we protect our independence when we involve the foreign court of a foreign king in our most intimate political decisions? The second impoverishment of vision is that the SNP are committed to retaining the pernicious influence of kirk and church in a new Scottish society, perpetuating the sectarianism and division that causes such fundamental harm in Scotland today. This is a determination to embed the infrastructure of division into our constitution. The influence of the church in Scottish public life is deeper and more pernicious than I had ever realised before I came back to live in Scotland some nine years ago. For instance, all councils are obliged to appoint three church representatives to sit on their education boards, and many councils actually permit these religious appointees as members of full council as well, a fact which would horrify most secular Scots. Secularism is ensuring that no religious party is privileged in law or the practice of government, at any level in a state. This protects the interests of all religious groups and ensures that none are disadvantaged by privileging another above them. The educational apparatus at the heart of our sectarian division is promised to be continued. Denominational schools would continue unabated in an independent Scotland. In other words, publically-funded schools will continue to indoctrinate their own particular brands of religion to children as young as five and six, acting as incubators of sectarianism and division for the next generation. State-sponsored bigotry has no place in a society which strives to secure equality for people of any religious persuasion or of none. The Scotland I would like to see would be a secular republic, not one in which priests, ministers and moderators have hold of longer levers of power than even they do now. It is for the proposer of a motion to make the case why their argument should prevail. Similarly, the customer is under no obligation to buy, no matter how oleaginous the salesman. Many enthusiastic supporters of the Yes campaign would like the un-persuaded to make the contrary argument, forgetting that it is the failure of their own case which requires the greater scrutiny. It has been said that this is the opportunity of a generation and, if we don’t grasp independence now, then it won’t come our way again for a long time. That may be so, but we always have now the opportunity to build a fairer, more just and more secular society through our existing institutions; the Scottish Government appear determined to embed injustice and inequality in independence. I would rather know that I’ve got a chance to fight for a secular Scotland in the Union than know that religion is to woven into the rip-stop fabric of a new constitution. Peejay, you probably won’t agree with much of my argument, or even my conclusions, but I hope this gives you a bit of an insight into my thinking. I am persuadable, I just wish there were statesmen fighting for the cause of Scotland who could make me believe their vision. Thanks to Paul for bringing this to my attention, I’m now bringing it to yours. Unless you can provide some convincing evidence that your god not only exists, but thinks what you think he thinks, the question of what God does or does not think should not be part of the political discourse. Today we learn that the analysis of the 2011 Census for England and Wales shows the number of people in the countries expressing no religious affiliation at all at a record level of 25%. That’s doubled since the last census in 2001. Unfortunately, comparative statistics from the census in Scotland are not yet available, but I’d be surprised not to see a similar trend.